All the curtains I make are hand stitched along the side seams and hems. Whether they are lined or interlined. 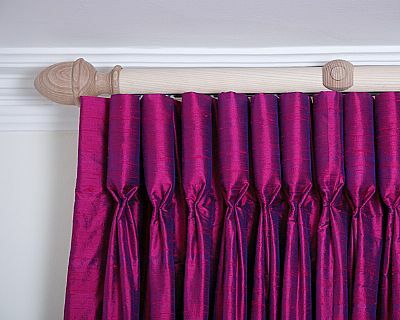 You can choose from a selection of heading styles, linings and trims to make your curtains totally unique. Have a look at my fabric page. It gives links to all the fabric companies I can order through. Most companies' websites show their complete collections with some suppliers also having coordinating wallpaper and accessories. The 'In Stock' page shows some of the materials I already have in my garden workshop. I will happily come to your home to advise on suitable styles and colour schemes. Taking measurements from your existing fittings or suggesting alternatives if required. 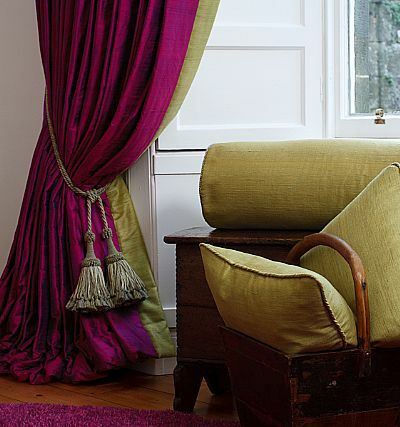 Alison Muir Soft Furnishings can provide an installation service using a local fitter. Distance restrictions may apply.